The All-new Juke 1.6 DiG-T 218 NISMO RS is made for the love of driving. As the ultimate performance version of the Nissan Juke, it combines impressive power and control with design inspired from years of racetrack expertise. It's not just a performance car, it's a NISMO RS that gives you motorsport excitement on the road. Nissan are passionate about performance. That's why we offer the ultimate thrill ride with the Juke NISMO RS. Bringing together decades of racetrack expertise, the Juke NISMO RS is Nissan's ultimate performance crossover. Engineered to the highest standards, wind tunnel tested and competition inspired, Juke NISMO RS is built with performance at the heart. And it shows, with up to 218PS and 280Nm torque on tap in the DIG-T 218. A specially designed exhaust gives the NISMO RS added bite and increased performance. The large-bore pipework and enhanced-flow silencer produce a deeper growl that hints at the compact SUV's racing roots. 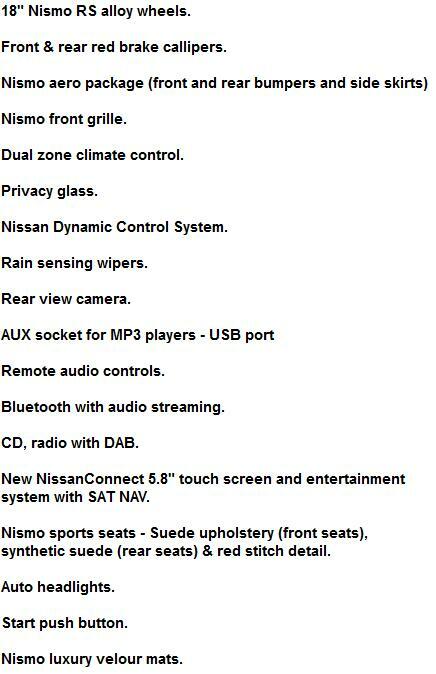 Nissan Juke Nismo RS 1.6 DiG-T 218 prices based on contract hire or Juke Nismo RS personal car leasing over 48 / 36 Months. Please Click Below For A Free Cheap Nissan Juke Nismo RS Leasing Quote. If you would like a full quotation on leasing a Nissan Juke Nismo simply complete the quote request form above and we will send you a full business or personal car leasing quotation. 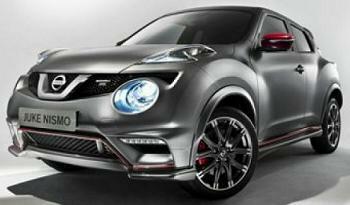 Car Tax included for the term of the Nissan Juke Nismo RS car lease. *For more information or alternative prices or other miles on the Nissan Juke Nismo cheap leasing car offers please call us on the below number.